“Municipal government doesn’t often go hand in hand with glamour,” magazine says in praise of Rawlings-Blake. The evolution of a fashion plate. Thirty years ago, Esquire magazine named William Donald Schaefer America’s best mayor. Over the weekend, Mayor Stephanie Rawlings-Blake was ranked America’s best-dressed female mayor by another national publication. It awarded her a position on the chic scale below Mayor Anne Hidalgo of Paris as the world’s best-dressed female mayor – and just behind Rahm Emanuel of Chicago as America’s top municipal fashionista. 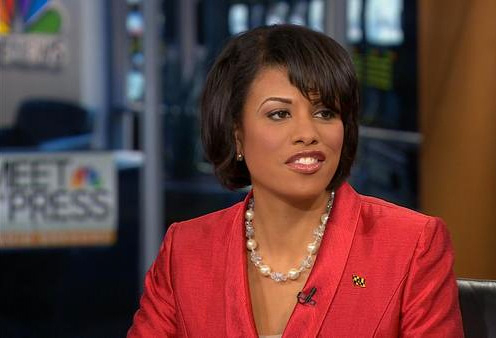 Rawlings-Blake’s array of high heels – which recently found their way on neighborhood crime patrols and in photo ops with residents displaced from the 26th Street collapse – were cited by Vanity Fair as one of her signature styles. The magazine, for example, really dug her combo of stilettos and skinny jeans at the city’s Pride Parade. Looking good is important in the world of politics, all the more so for a female finding her way in a male-dominated profession. Hillary Clinton knows it and Sarah Palin proved it, though raising the issue publicly can evoke cries of sexism. Rawlings-Blake’s style differs from that of, say, Michelle Obama in its reliance on makeup, gloss, eyeshadow and accessories that belies a careful attention to detail and a flair for the dramatic (a bold, clunky necklace, an array of colorful bracelets). Rawlings-Blake battled overweight during much of her career in city government (which constitutes her whole career, starting out as a northwest Council member at age 25). The same problem beset her dad, the late state Delegate Howard “Pete” Rawlings. 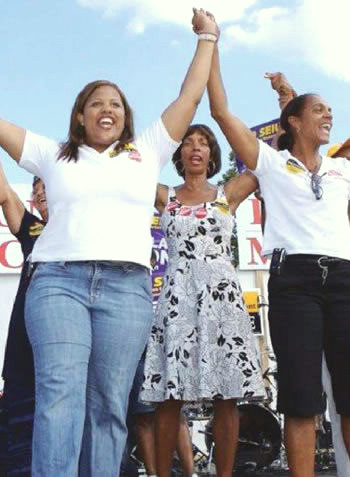 But after becoming the city’s unexpected mayor in 2010 (due to the forced resignation of Sheila Dixon following her corruption conviction), Rawlings-Blake went on a slimming campaign that transformed her life. Not only did she become one of the “biggest losers” at City Hall, she tossed out her wardrobe of shapeless suits and cut her lifeless straight hair. She apparently needed to get control of her body as she took control of city government – and in the process, she pushed back the clock a good decade. (She turned 44 in March). Rawlings-Blake in Vanity Fair. She came in 5th worldwide in the mayoral fashion sweepstakes behind Boris Johnson (London), Anne Hidalgo (Paris), Giuliano Pisapia (Milan) and Rahm Emanuel (Chicago). Today, the mayor is known for giving out diet and exercise advice to constituents. She allots time (and sometimes campaign lucre) to salon stylists, and carries herself well at City Hall functions (where her outer office features an endless loop of photographs of her activities on a flat-screen TV). Over the last two years, she’s turned heads while moonlighting as secretary of the Democratic National Committee and ranking officer of the U.S. Conference of Mayors. She’s also lit up the talking-heads circuit on NBC’s “Meet the Press” and other broadcasts. In short, she isn’t afraid to flaunt it.